Home Products Inc.: 3 Reasons Why Wireless IS Better. 3 Reasons Why Wireless IS Better. I'm sure it isn't a great surprise to anyone that wireless security cameras are far preferred over wired ones. In a world where nearly every single piece of technology created has a wireless version, it only makes sense that security cameras would follow suit. But why, you may ask, is wireless so much better than wired and why would it make any difference to me? Well, the answer to that is simple. There are a lot of different advantages to going with a wireless security camera system over a wired one, but here we are going to focus on three main reasons. If you take into account what these three reasons have to say, you may find yourself demanding not only wireless security cameras but also a completely wireless life. Wireless security cameras provide much more aesthetic value than wired security cameras. What I'm saying is that you do not have to worry about wire length, wrapping wires around your home or business or making sure you have an easy access route for your wires to feed through. When you go wireless, you do not have to compromise on the effectiveness of your system. A wireless security camera system allows you to enjoy all the features of a wired system without all the hassles. One problem many security camera installation companies deal with is accessibility. Installers can have the perfect setup for any business, but if the business or house doesn't have the right style to accommodate a security camera system, then there is nothing you or the installers can do. However, if you go with a wireless system, you do not have to worry about accommodating for wire length. Wireless cameras can be installed easily and can even be moved on a whim if you desire, something a wired system can't do. 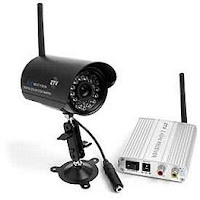 One of the biggest benefits of a wireless security camera system is that it is highly portable. You can use it as a temporary security measure or as a seasonal device if you have need for it in some months but not in others. Keep a wireless security camera focused on your pool in the summer to keep unwanted guests out and then take it down in the winter. Wireless security camera systems are also good for places like construction sites where you may need to monitor stock or equipment on a temporary basis. It is easy to see all the benefits a wireless security camera system has over a wired one. A wireless security camera system offers many things a wired system cannot, including better presentation, accommodation and portability. In a world where everybody wants things to be faster and easier, it doesn't get much better than wireless. Whether it be your headphones, laptop, video game controller or security camera system, nothing beats the convenience of going wireless. Fantech products now Revit models!